A new team, a new car, world class opposition and one of the toughest races on the planet. It was going to be a tough baptism, but it turned out to be a huge success for all of us on the Rollcentre Dallara Squad. After a week spent learning what works, and what doesn’t, with the Dallara-Judd, we got to raceday with a car that was comfortable to drive and as good as it could be over the punishingly bumpy circuit. 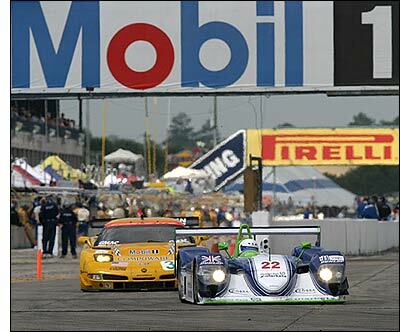 We lined up fifth on a bumper 44 car grid, with just the three Audi R8s and a very quick Dyson Lola ahead of us. Joao Barbosa started for us and soon got settled in to a really fast pace. 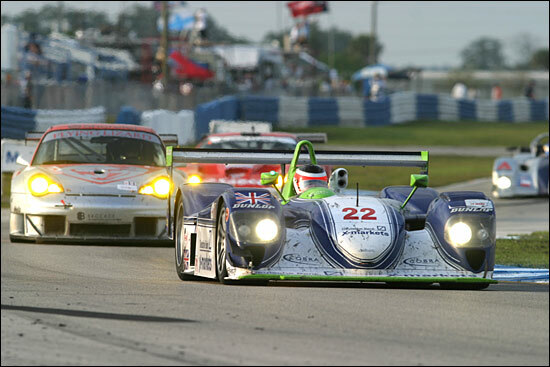 While the Audis battled it out, we were able to hang on to the Lola, as it fell away from the steamrollering R8s ahead. He had a great dice with James Weaver who really knows his way around this circuit, and things were looking very good indeed. Joao double stinted very comfortably and then it was my turn. The car was fantastic and the Dunlops were proving to be absolutely superb, we went far further than we ever thought possible on them. Dunlop was using a new combination for the race and it was able to last a double stint from the very start. It was very, very busy out there, the closing speeds are tremendous and it can catch you out. I had a bit of a moment with one of the Corvettes. I thought he had seen me but he clearly hadn’t, he turned in for the apex and we made contact. It wasn’t a big impact but it was enough to put the GTS car off the course on the outside (he continued) and wiped off the dive planes on the left front corner of the Dallara: it could have been much worse but it was a bad moment. The times though were coming quite easily. We were giving the Audi boys something to think about. There were so many high points it seems almost churlish to point to one but this one was a really great moment - I overtook an Audi! I was going into turn ten and got inside Jamie Davies in the #88 R8: we might not be quite on their ultimate pace over a full race distance but we were way closer than most people ever thought we would be at this very early stage in the programme. It just got better and better as the race went on. Joao and I were double stinting throughout and Martin was getting some good times out of the car too. 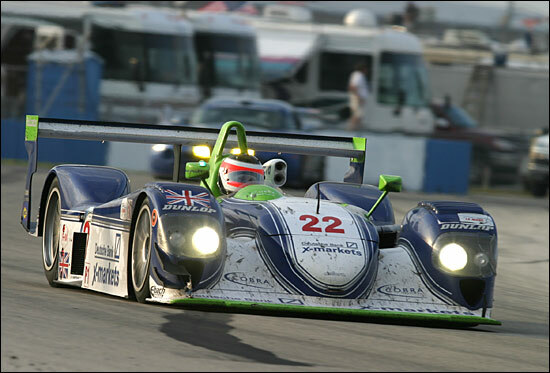 When the Dyson Lola hit trouble we climbed to fourth. We then hit our first problem when the pins holding the left rear hub came out. It was bad but not fatal. We lost several laps to the Audis but then the #88 hit trouble too and needed to go behind the wall for repairs. We got back all the time we lost with our own problem - and more - and emerged several laps to the good on the chasing pack, in a fantastic third place. It was time to get our heads down and the Audi boys were doing exactly the same. The #88 car fell back to 7th place but that wouldn’t be good enough for them – we would have a battle on our hands to the finish. 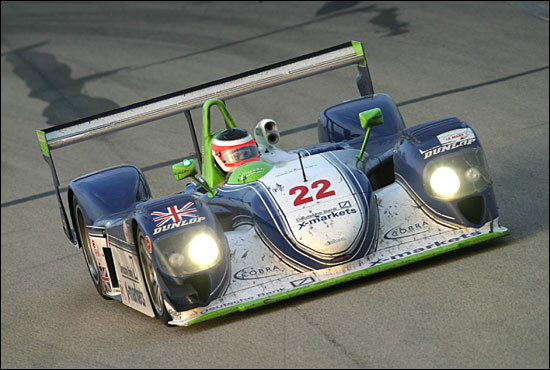 The times were still coming in, the car was very quick and very consistent. Confidence was high, but as always in these sorts of situations the nerves were jangling. We were holding our own as the Audi carved its way back up the order: it was making up time on us far too slowly to catch us if we stayed out of trouble. If only endurance racing was that simple! Just as we thought we were relatively safe, the same problem happened again with the rear hub, we lost all of the advantage we’d held over the Audi and it was now a matter of seeing whether we could stay in touch to take advantage if they stumbled again. Sadly they didn’t and we did. A freak failure of a throttle linkage costing us more time in the pits and dropped us down to fifth place, behind the factory-entered Corvette. It was time to go into very fast cruise mode, stay well ahead of the cars behind (several laps behind!) and keep going quickly enough to take advantage in case one of the four fabulous cars ahead of us on the road faltered. It was not to be. Martin took over from me and got back into the car for the last session and took the car to the flag. It was a strange feeling. If we’d have been told before the race that a fifth place finish was on the cards, I’d have been very pleased, but having held third place on pace somehow it felt like a failure. Seasoned observers in the pitlane and the pressroom were amazed at our performance and I’m sure when I wake up tomorrow I’ll feel quite a buzz that we’ve finished so well in this beast of a race. 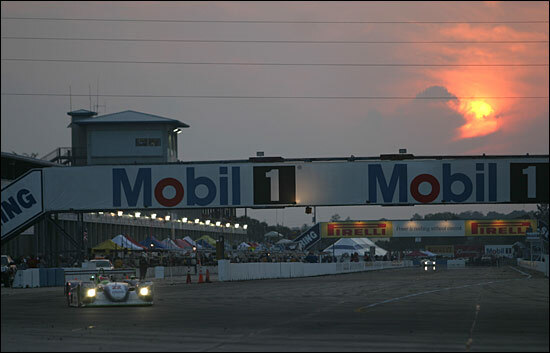 For the time being though it’s good to remember that we came to race at Sebring to do two things. To find out more about the team and the car, and to make a big enough impression to ensure an entry for the car at Le Mans. We learnt plenty about the team and the car, almost all of it good, and here’s hoping that we impressed those at the ACO who are responsible for choosing the 50 cars that will take to the track in June for the Le Mans 24 Hours.